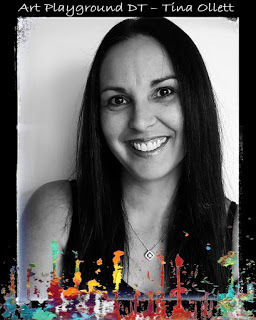 A huge welcome to all my friends who are a constant support to my creative world. This week has been one of a creative capacity like I have never had. One project after the other and I have loved every single minute of it. 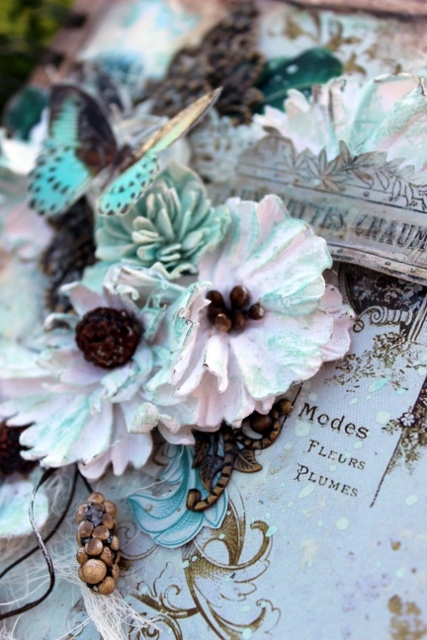 I can’t say I have ever come across or even used Decoupage Papers before. But when I saw these beauties in my package from Aastha Jain at Papericious, I knew then and then exactly how I would be using them. I know there is probably an exact way to use Decoupage Papers, but me being me, I just went on my merry old way doing it my way. 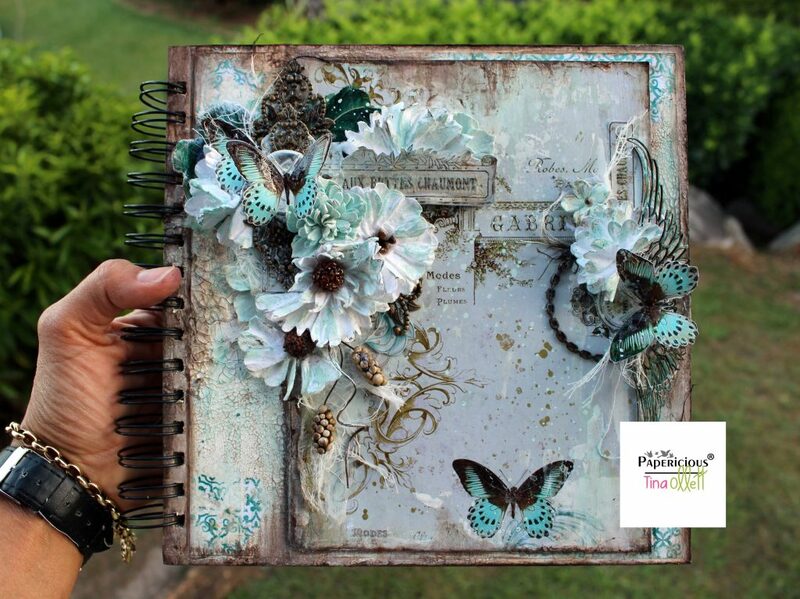 I have used the Papericious Journal Book that was also in my goodies package. 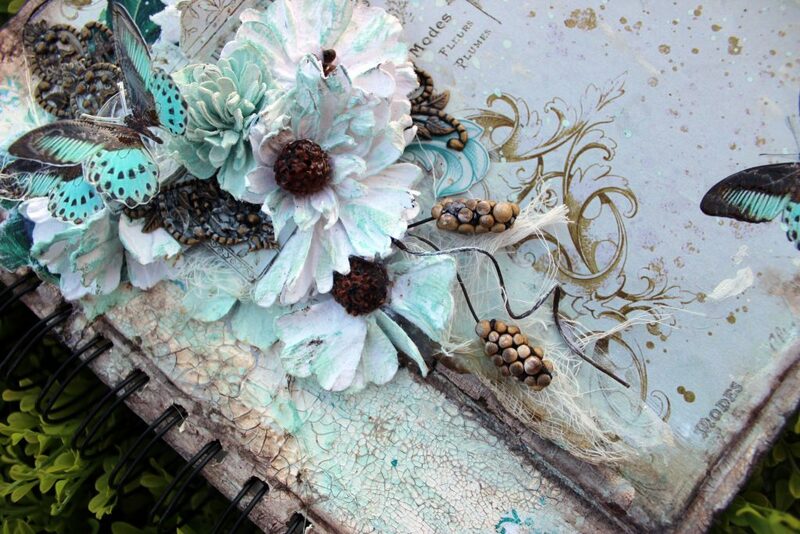 This is a really beautiful journal book. This size is just gorgeous and the quality of this book is amazing to say the least. Each page in this book is of a thickness beyond anything I have ever seen in a journal book. Perfect for pages with lots and lots of media. My first thing that I did was to prime my book cover. This journal book cover and insert pages are divinely thick and do not warp with any amount of media let me tell you. 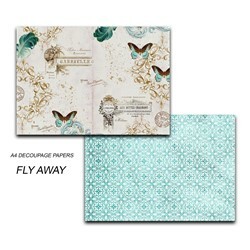 I used the Green Decoupage Pattern sheet from Fly Away first and then layered the half of the butterfly Decoupage sheet also from Fly Away over the top. Once done I started layering Crackle Paste over the top to create another layer. I then went to work on fussy cutting elements from the remaining sheets whilst the Crackle Paste dried. I looooove vintage and this is where I went with the cover. 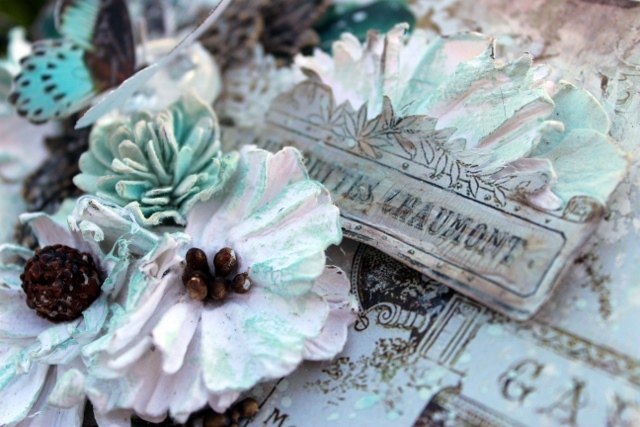 Evergreen Bough, Walnut Stain and Ground Espresso Distress Inks were a perfect match for the colours in the decoupage papers. 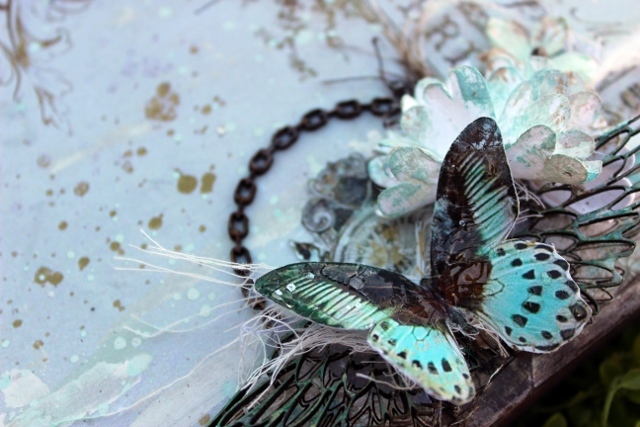 And oh my goodness the Papericious Chipboard Wings Collage matched this perfectly. So once my layers of papers and fussy cut elements were adhered I went to work on colouring the chipboard collage wings. 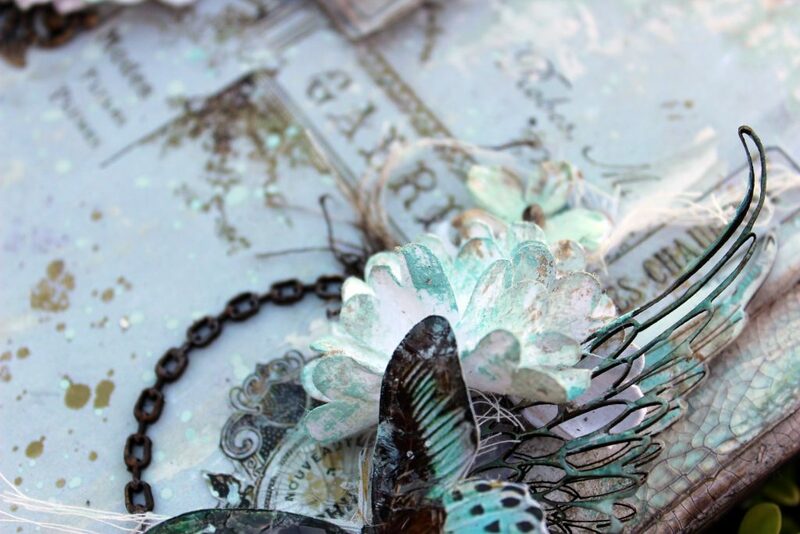 This is an insanely gorgeous piece of chipboard. I decided to make many layers with this cluster at the edge of the book. 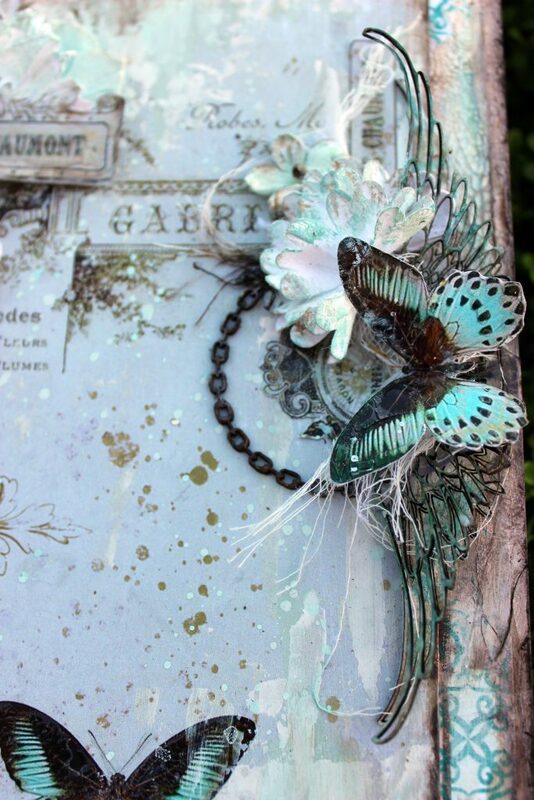 I have added in the cutout section of the label from the Gabrielle “Fly Away” paper and then added the first piece of chipboard which was dressed in white gesso and inked with Walnut Stain and Evergreen Bough. I then layered some muslin and then the skeleton wings which was inked in Evergreen Bough and covered with Clear Crackle. 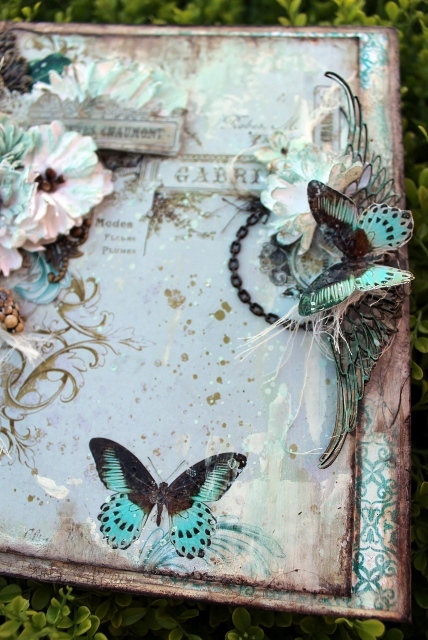 I then added on top of this a cutout butterfly. It was dressed in Clear Crackle and dry brushed with a little gesso. You can see below the outcome of the clear crackle and the layers. I have also added in some charms from my stash that I have cut up and tucked in at the top cluster to add another layer. And also some more muslin and fussy cut elements from the leftover paper. Above here you can see the outcome of the crackle, inks and layers of gesso with flowers added in. The papers really leant themselves to this journal cover. Looking at the papers there are so many elements to choose from. 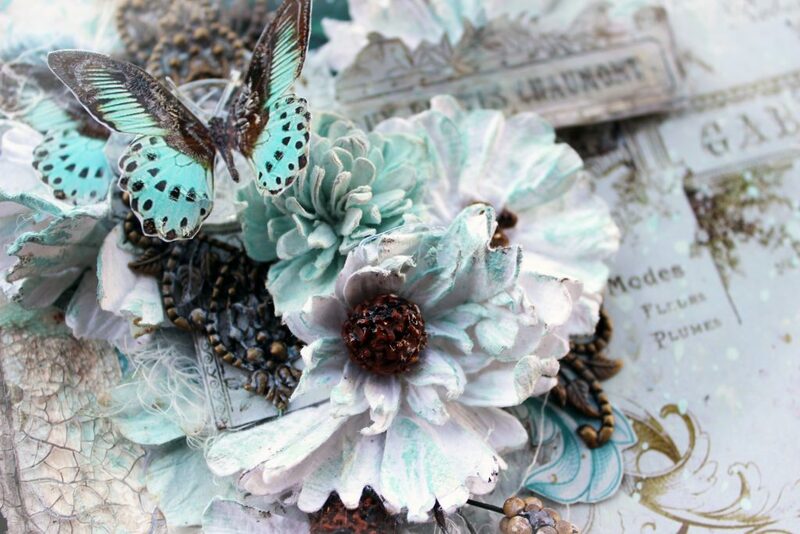 I have used some of my favourite 49andMarket flowers to co-ordinate with this project. 1. 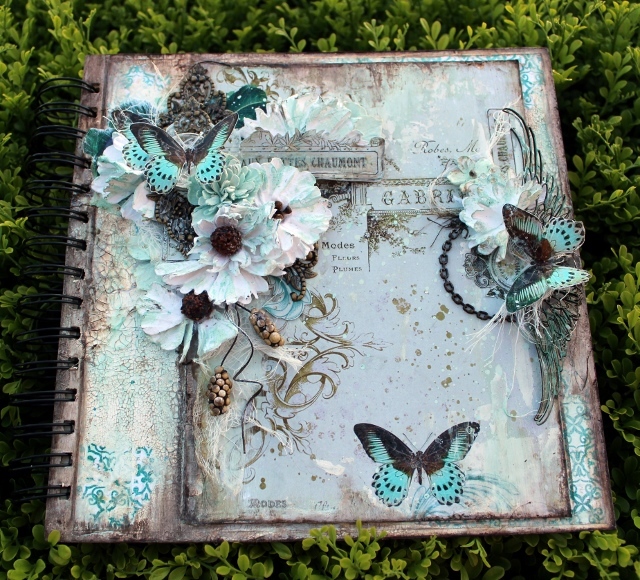 You can create any project – Altered Items, 3D projects, Home Decor, Cards, Layouts, Mini Albums, Scrapbooks, etc. 2. Remember that you need to use Papericious Products as your main focus to qualifying for the win. 3. The last date of submission of your projects is 9th January, 2019 at 11:55pm IST. 4. Please go through the general guidelines HERE before you link up your projects. Any project not following the rules will be disqualified and it will not be eligible for the prize. 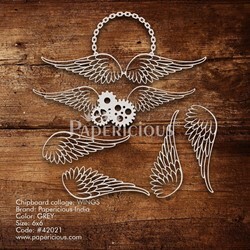 Please note – The main focus should be on Papericious products and do mention the products. The DT will be selecting a Merit Winner at the end of every challenge who will stand a chance to win a gift voucher worth INR 500 from the Papericious Store. 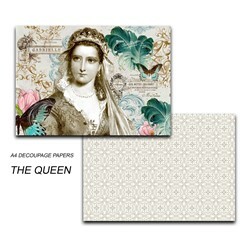 We will also be having a Random Winner from all the entries who enter their projects every month to win a Papericious 6″x 6″ Pattern Paper Pad. That is all from me today. I hope I have inspired you today in some small way to give our challenge a go this month over at Papericious.